The Cultural materials of any Montessori Plane of Development are by far my favourite and I would also humbly say, the most important. They are what we as the trained Guides use to open up the vast wonder of this world to the child. The Tree of Life Bundle from Waseca Biomes is one of those materials that you find yourself staring at over and over and so when I had the opportunity to meet Alli and the Waseca Biomes staff in person I felt I couldn’t hold out any longer. I called ahead of time and purchased the bundle and they graciously brought it with them for me to pick up. It’s even more stunning in person. The entire wooden puzzle sits on a gorgeously designed thick vinyl mat. This is the control of error. The mat is perfect. It lays flat, has a good weight without being heavy and most importantly it can be wiped. A must when it will be used by classroom after classroom of children. The child then builds the wooden puzzle over the mat. 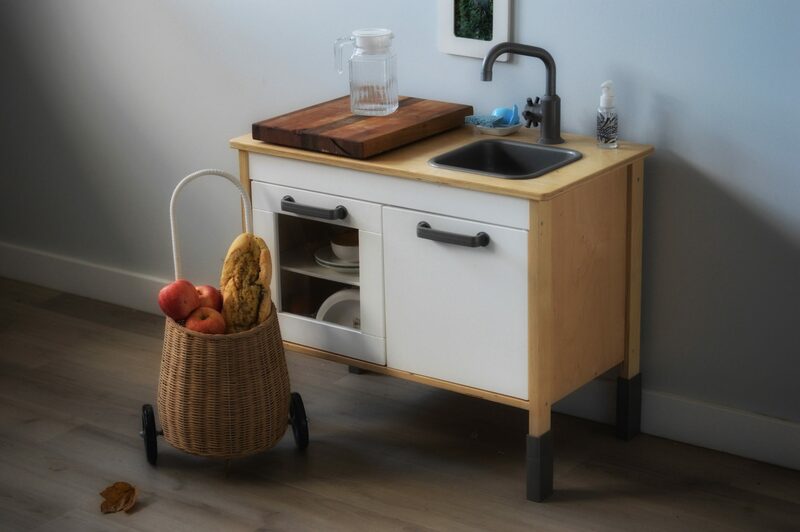 Each wooden piece is a perfect fit which is important for young children trying to maneuver the pieces into place. The Guide of Presentation (pictured above) lists each step in the sequential presentations given to a child. The first asks the child to sort the leaves into two groups: plants and animals. This alone is tricky as some plants and animals have similar features. The conversations are virtually limitless with this work. The art (as with all Waseca Biomes materials) is what gets me every time. Realistic, simple and absolutely stunning. Quentin loved that an Emperor Penguin was included in the bird branch and a lengthy discussion followed by some research topics evolved from his observation that the bird branch comes from the reptile branch. We have loved using this book for years and it is the perfect companion piece to the work. He finally sits back to admire his work. The mat along with the information cards that come with the set will spark many more conversations in the future. We are forever grateful for the kindness Alli has shown us over all our years of purchases. As Quentin continues through the Montessori Second Plane of Development this material will evolve into so many more discussions. It’s hard to believe I started this little book club two years ago. There have been so many amazing books over the years and 2017 was no different. One of our very favourites was Here We Are. We are madly in love with Oliver Jeffers children’s books. The artwork asks the audience to stop and take a closer look, something that’s important to me. So many books miss this critical aspect of a good children’s book. Then there’s the written message. Does it speak to you and the child who is absorbing the story? This book speaks to us very very much. If you haven’t had a chance to read this one, go and see it out. You won’t be disappointed. Thanks for joining us on this journey of seeking out well written, gorgeously illustrated, diverse books. We will be back early in the new year with our latest finds. We have so many favourite Montessori compatible Winter books and were going to post them today, but we have been patiently waiting for someone (anyone really) in the Montessori social media world to post this book as it is one of the very few traditional Christmas themed books that is truly compatible with Montessori. It’s not that it’s a new book, it’s just I suppose a little less popular than others. We all have our favourites from our own childhoods or ones with beautiful art, but when we are looking for a truly Montessori compatible book for teaching the traditional message of Christmas, just as we do with all other books we seek for our children what are we looking for? What are we choosing? Are we choosing books that are reality based or are we choosing books with a very whitewashed version of a humble family of Middle Eastern decent looking for shelter in Bethlehem? Above all, are the books we choose broadcasting a strong message of inclusivity, love, hope, and peace for everyone? Originally read by Angelou herself at the White House Christmas tree lighting in 2005, it is a stunning book. Focusing on the traditional message of Christmas, it brings together Christians, Muslim’s, Jews, Atheists and many more by acknowledging that whatever our differences, we can come together. We can do what Maria Montessori asked of us. We can build peace not only in ourselves but in the world. We talk about this frequently on our Instagram account especially at this time of year when everyone’s “Best Stuff to Get Your Kids” Lists are cropping up. That although giving stuff to kids is fun for the adult, it’s not what they really want or need. What they really need is your time. So I thought I’d share one of our own recent experience gifts because it’s not enough to just say it is it? We must practice what we preach. A day at the local Natural History Museum is one of his favourite outings. As you can see, there’s a lot to see. Quentin enjoys the the first floor the most because it focuses on the animals of our region from prehistoric times until now. Museums are the perfect space for children to explore. Lots to see and do and share with an adult. This is the perfect time for a child to take the lead. When we are on an outing together we always remember to follow the child. Their path through an exhibit may not be the one you would have chosen. We return three times to look into this microscope to look at the small shoreline creatures that inhabit our local fresh water edges. This takes a lot patience! There’s so much to see and the tendency of the adult is to keep moving to see everything. It’s not the same for the child. They may focus on one area, or they may rush through the entire building at break neck speed. But the success of the outing depends on how much they have enjoyed it. And so we follow the child. An interesting thing to note is that the financial cost of the experience (in this case a year’s pass to the museum) is actually less expensive than the pile of stuff he could have been given. Follow the child. A trip to the water theme park, art gallery, museum or a walk in the forest are all perfect for different children. Choose an activity your own child would love. Do your research. Places often offer season passes or yearly memberships. These can often be extremely inexpensive for the amount of times you will use it. Think of your own needs. If roller coasters aren’t your thing, you are likely not going to be taking your child to the theme park that often. Even if you did buy the season’s pass. Find something local and awesome. There are so many hidden community gems. Ask friends and family about their favourites. Seek adventure. Sometimes the best experiences are when you travel. Consider taking your child to see something amazing, even if it is only in the next town over. Looking back over the years it is the times I have spent out and about with my children that are some of my favourite. As the gifts pile up, it’s up to us to think about what we want to pass on to our children. 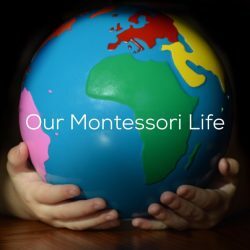 Montessori Peace Education is at the forefront of my approach to the pedagogy and so when I was asked on our Instagram account last weekend to host a theme on another site, Peace Education is what I chose. These are some of the materials use at home and in my Montessori 3-6 classroom. It is a simple exercise kept in a basket or tray that children can choose freely in the same way they would choose any other work. The Emotions and Mindfulness cards are from Diamond Montessori and can be found here. They are 3 Part Cards so there is an accompanying set of solo picture cards and also a set of solo word cards to match. They can be used with even the youngest of toddlers by simply exploring the different faces each child is making and we love that there is a wide range of ethnic diversity in them. Our Love Light house. Both in my classroom and at home we use the concept of a love light, an internal light that can either shine brightly from each person or can be extinguished with nothing more than a little hot air. The concept comes from this book and we adapt many activities found in it to suit our needs. This little dish was a gift from a dear Montessori friend and teacher. It is a beautiful pottery piece made by a local First Nations artist. We keep it in our Peace Tray and we fill it with freshly ground lavender when Quentin wants to. Sitting with it on a work mat a child can choose to smell the sweet and calming smell. This book is a new addition and couldn’t have arrived at a better time. We have been anxiously awaiting it as it is absolutely perfect for a 3-6 year old child to actively engage with. The pictures are simple and so is the text but the message is a powerful one. Each of these activities and many many more are so easy to take the time to do with children. The sense of calm they can invoke in a child is remarkable and will help a child with so many important social emotional aspects.